Many of us are required to take major tests to further our careers. Why do they push our emotions to the limit? What is so hard about proving what we already know? What makes studying so difficult sometimes? Big tests like the Bar Exam, Licensure Boards, GMAT or GRE usually have a big impact on the future and how we think about the work we’ve done so far. Doing well on them often requires things like rational thinking, detailed memory, and prediction, which are qualities that can contradict our emotional strengths. The format and question types on these tests also often test our reasoning more than our content knowledge. One thing we all know is that when we are nervous or self-conscious, we are not at our best and our physical and mental health can be affected. Whether this manifests in increased headaches, cold symptoms, lack of sleep, poor eating habits, or emotion regulation problems, it’s often difficult to escape around test time. It’s important to acknowledge this and give ourselves permission to have more self-compassion and encouragement. One way that often works during this time is a general sacrifice and reward system that is self- assigned or suggested by your therapist. This can be as simple as limiting something like Facebook until after studying is done for the day. From there, it can take many shapes like prohibiting important TV shows or favorite foods are prohibited until after the test. These practices may seem minimally related to studying and test taking, but if done right, they can have a direct improvement on things like confidence, sense of accomplishment, and self-assurance, thus improving your mental health during a stressful time. They also can improve focus and reduce overall distractions. High testing anxiety typically correlates to lower study skills and test taking skills, according to the American Test Anxieties Association. Even though test anxiety is sometimes unavoidable, it can still be very helpful to improve study habits. Create a consistent and sacred study practice for yourself. Some examples of things to consider are: Eating the same simple food on study days, keeping specific music that is calming and relaxing for studying only, establishing rules about cleaning and chores on study days, and also maintaining consistent study environments. These aspects can help improve focus and therefore allow us to access the strengths and skills that already reside within us. Coping with a period of time before a test can be emotionally trying overall so it is important to be mindful of where the pressure for this test comes from. Is there something to prove? Is pressure added because of minority or income status? Do you have a history of high expectations of self or perfectionism? Mindfulness meditation techniques can help with these issues by helping us control which of these thoughts steal our attention and which ones enter and exit our mind swiftly. The fear of a failed or low test score can have a major impact during study time as well. We know that, for test taking, we need to predict the questions as much as possible. We know that for emotion regulation, we deal with things better if we don’t predict what will happen. There is no way to rehearse the event of a failed or low test score. During therapy sessions, I often remind individuals that the version of us that copes with a failed or low test score is a version we have not met yet, so do not underestimate it. Similarly, the version of you that scores lower on a practice test than you’d like is not the same version of you that will take the test on test day. Here are a few other things to keep us at our best before test day. It’s important to reduce or eliminate alcohol consumption because it can directly impact things like sleep and focus. Sleep is important to integrate knowledge and process thoughts. Starting a list of “forgets” can also be a great way to clear out mental stress when trying to sleep or focus. A list of “forgets” is a list that we add to whenever we remember something that we need to study or do for studying when we are trying to relax, sleep, or focus on something else. This reduces the mental stress of remembering to do this later. 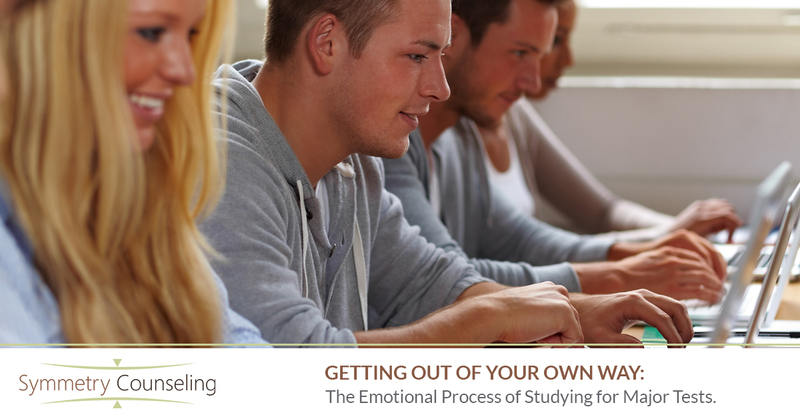 Another tip that is widely recommended is this: Do not study when you’re not supposed to. This is just as important for your mental health to reduce pressure and allowing you to trust yourself. Career goals have a large impact on our sense of self, which makes these tests an experience of emotion and identity. Self-compassion and self-trust are important things to maintain before during and after big tests. If you struggle with test anxiety, or anxiety in general, contact Symmetry Counseling in Chicago. Our team of compassionate counselors can help you learn the tools to handle your testing anxiety and learn to cope with that stress healthily. Contact us today for more information!